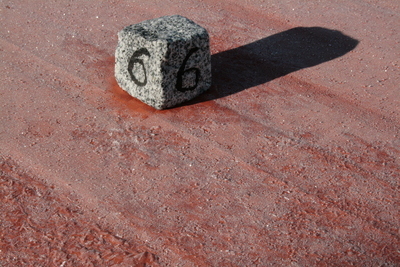 the day starts grey but dry. 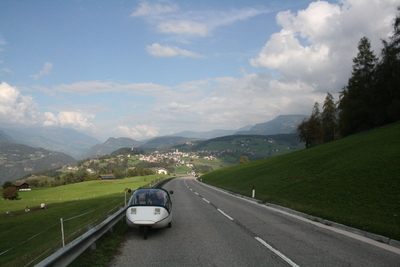 with a fully charged twike and our hotel just metres away from the start of the umbrail pass, we start our ascent with virtually 100% in our batteries. 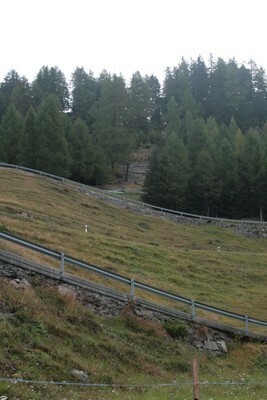 the umbrail pass is very, very steep. the pictures cannot really convey the challenge TW560 went through. it’s even crazier and steeper than it looks! 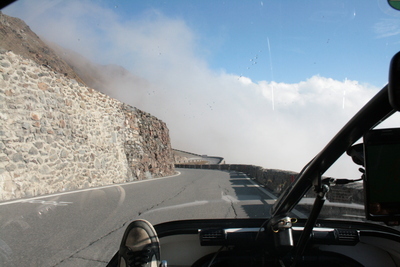 just before the umbrail pass, we enter some higher layer of clouds which engulf us within minutes – temperatures drop at the same rate and we are left with about 3°C. brr, just a quick hop out of TW560 to take a picture! 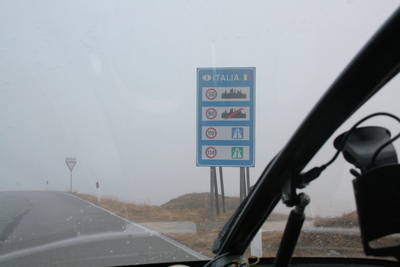 just a few metres after the pass, we enter italy. 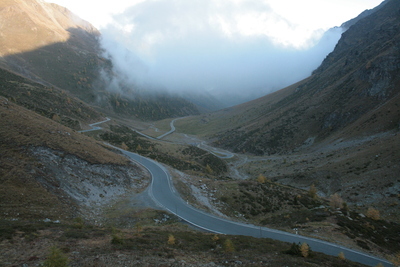 and from there, there is either a road heading back down or – for us – the left turn towards the passo di stelvio. 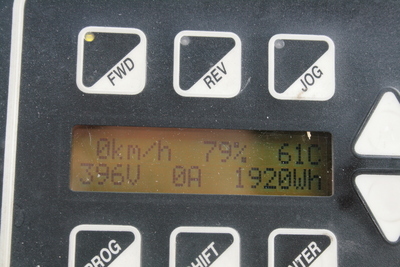 motor temperatures stay in an acceptable range, the clouds are gone as quickly as they came and within just another 20 minutes, we reach the top of the pass. 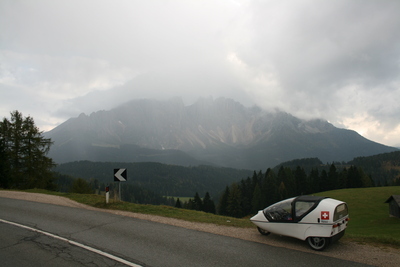 this is where we park the twike for a moment whilst we get ourselves a *real* italian coffee. our QR-code based info page works really well. 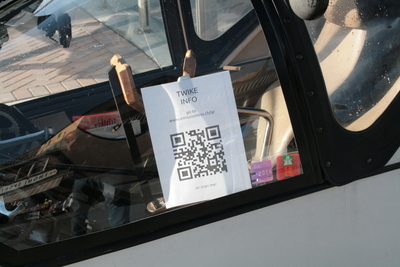 many people stop to scan the code and read about TW560. 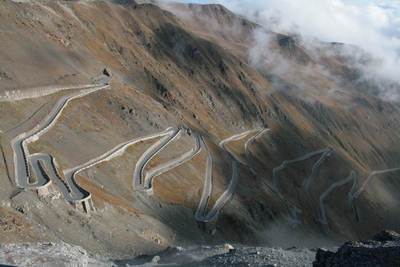 the most difficult thing will be to try to drive back down without using the breaks and relying on recuperation only. 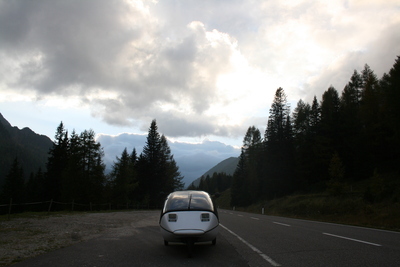 anyone who has driven a twike in the alps will tell you that this is easier said than done – especially with 200kgs more on board than usual! 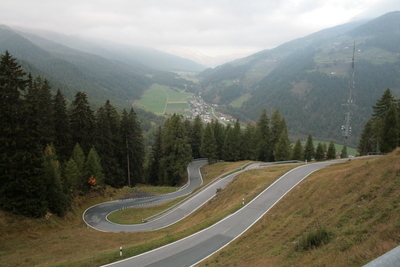 48 hairpin bends await us! 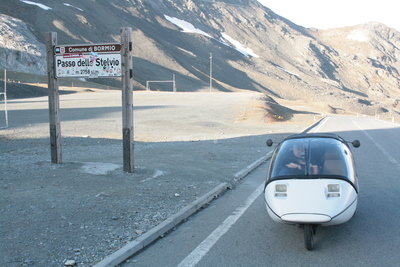 we used 3.5kWh to get all the way up to the passo di stelvio. let’s see how much engery we’ll get back whilst driving said 22kms. we start our descent with some dramatic blue sky / cloud combos whilst getting used to the hairpin bends with all the weight onboard. 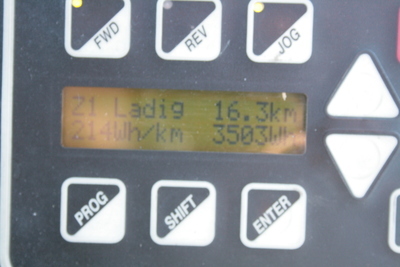 we drove 22kms *and* got back a full 1.583kWh – does anyone else need convincing that hot breakpads don’t smell well? the descent continues, albeit at a lower rate. 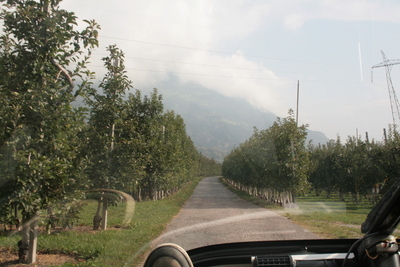 we drive to meran, and whilst indulging in our love for small one-lane roads, come past about 20kms of apple tree plantations. 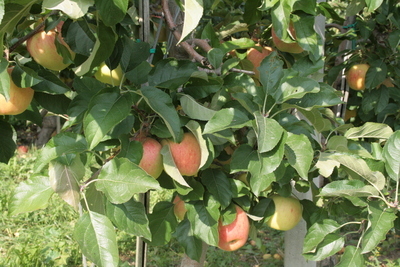 i hadn’t eaten any lunch and thought a healthy snack would be just the right thing – the apple i had was delicious. 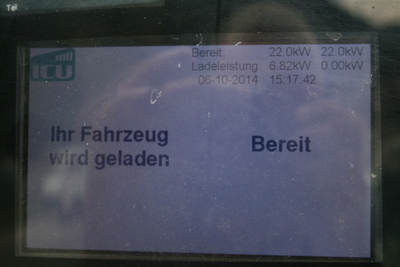 in bolzano, we determined that the remaining charge would not take us until the charging point we had planned to use. 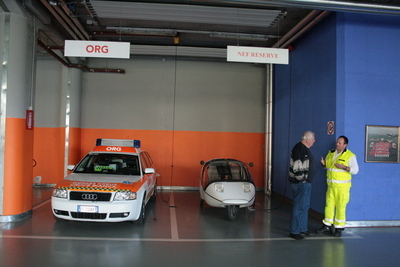 with only about 1.8kWh missing, we decided to pay a visit to bolzano’s emergency first responder team – knowing that they always have garages equipped with 16A plugs. we chatted with various team members for the best part of the half-an-hour TW560 was charging. 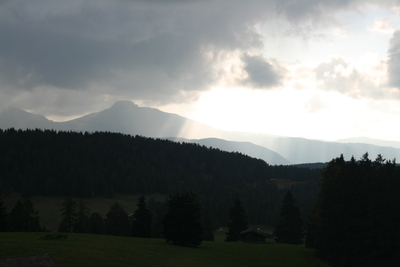 southern tyrol is an interesting mix of italy and austria. it has a complicated history leaving this part of italy speaking mostly german and having bi-lingual signs in german first. listening to various opinions about what the future should hold (stay with italy, go back to austria) gave us an idea that the region will remain undecided for quite a while. 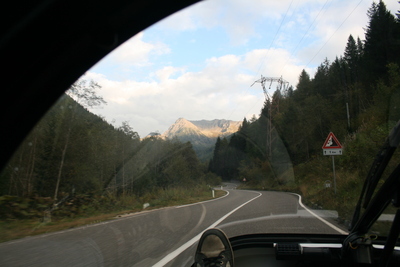 from bolzano we climb towards the niger and karer pass. 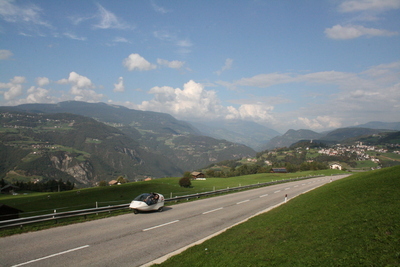 somewhere before the karrer pass is the charging point we had planned to charge for various reasons. the niger pass was stunning – just check out the pictures! no comment – just breathtaking! 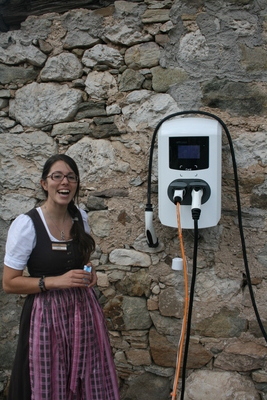 our battery slowly but surely was reaching the end of its capacity – we arrived at the next charging station (a private one) and were greeted with the usual ev-cameraderie. 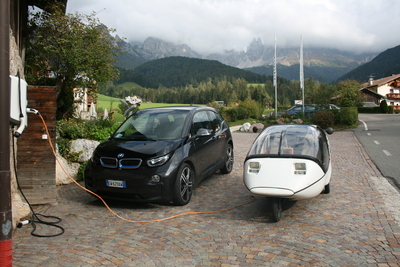 a hotel manager had bought himself an i3 from bmw and was very curious about TW560. we spend the best part of an hour discussing charging systems, plugs and kW’s. 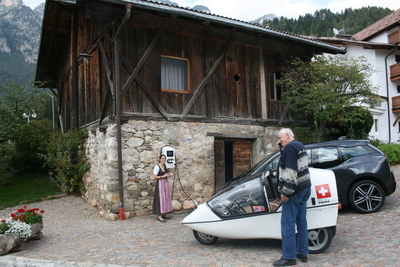 the hut with the charging station is over 200 years old! thanks to the cable i built not too long ago, charging at 32A was a breeze! 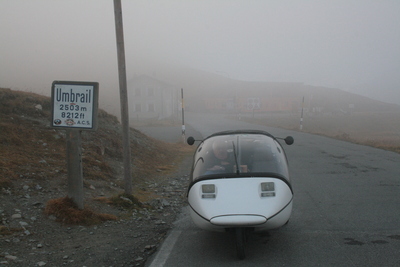 with a full battery of complimentary and co2-free juice (because it was locally produced just in time by the solar pannels on the hotel), we start another ascent towards the karer pass. 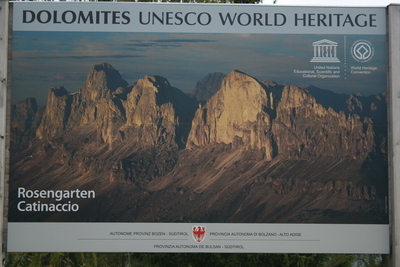 this pass is the entry point to the dolomites – a famous mountain range in northern italy. 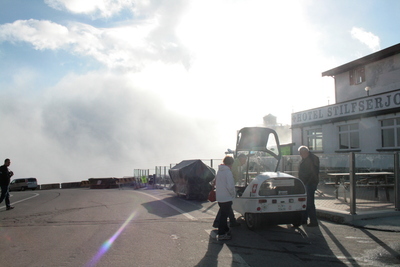 after crossing the karrer pass we drive into some clouds and some slight rain showers. the sun is still trying to get through – leaving us with some dramatic vistas. 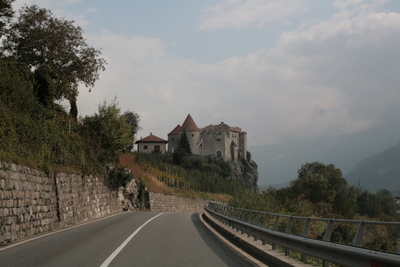 we then decide to just cross the passo di san pellegrino and then call it a day. 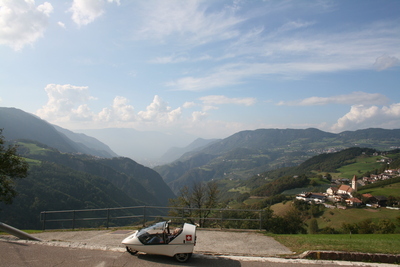 although we had planned to go much further, thanks to the nice weather and the many passes – we took our time, stopped frequently to take some pictures or just stay some minutes to take in the view. the last descent was the worst of the day. 18% decline, tight road, bad surface, darkness descending and us being very tired. 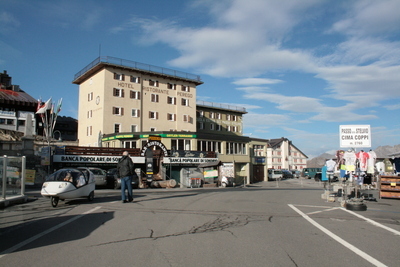 arriving in vigo di fassa, we faced another challenge: all hotels were inbetween seasons and therefore closed, all 15 of them we could find. but, as always, our good carma cought up with us and provided a solution: we drove towards a (closed) hotel and a guy came out to have a look at our vehicle. he told us that his hotel was closed and currently undergoing some redecoration but pointed us towards another hotel further down the road. we continued our fruitless search until the very same guy cought up with us by car and apologized for misdirecting us, told us that there are no other options in the village and that he would like to offer us a room for the night! after having some tasty food in the only open restaurant in the village, retired to our rooms very quickly and looked forward to a restful night!